The romance of life on the open road is captured in this converted horse lorry in a private meadow overlooking the Preseli Hills. New for 2017, is our horse lorry conversion, 'Rumenco'. This self-contained unit, which sleeps two, is private from the main camping field and accessed via an ancient bluebell wooded lane. The old horsebox retains many original features but has been made comfortable for campers with a double bed and carpets in the rear part of the cab along with a double glazed window and its own raised "tail gate" deck over looking the lower organic veg garden, wild meadows, grassland fields of sheep and cows and the Preseli hills. The driver's cab, has been refurbished, and features its own WC and a kitchenette area with a two-ring gas hob and sink. A wood burner, solar lighting and tea lights help to create ambiance and, along with the remaining original features, help recall its past equestrian use and give it a gypsy or canal boat feel. It offers a magical escape for the would-be equestrian, or a romantic break set in a private wildlife area. A fire pit and outdoor seating area, for summer or winter evenings around the fire over looking the Preselis and big clear night skies. North Lodge is a traditional campsite with picturesque views over the Preseli Hills in remote Pembrokeshire. Long grass and hedges surround a selection of the grass pitches allowing maximum privacy for guests. The unique off grid cabins and horse lorry all have their own private spaces. At night, campers can enjoy star gazing around a campfire and, by day, there are many beaches to explore just 10 minutes away. For walkers there's the Coastal path or inland there are many different woodland, hill and riverside walks. Campfires allowed at site owners’ discretion. 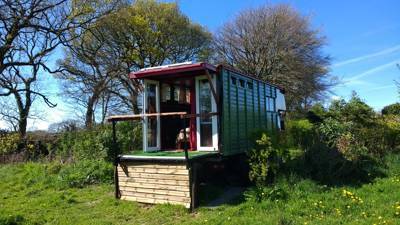 Ten pitches, one hook up; ‘eco-cabin’ sleeps up to five people with wood burner and open plan sleeping/living area and a kitchen shed, also quirky 'Horse Lorry' sleeps up to 2 people with wood burner and kitchen/lounge area. Both units have there own toilet, and a short walk away there is a well insulated shower for all year round. For campers onsite there is basic but clean washrooms and one shower (free), one normal and two compost loos (in separate area), drying area, communal cooking/fire/bbq area and indoor room with tea making facilities. 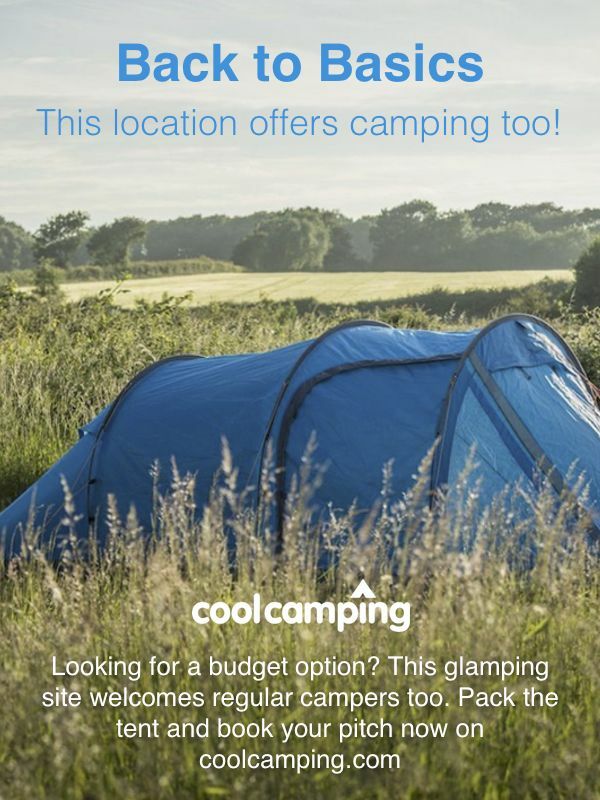 There’s also the option of four to six-person set up tents for lazy campers. Nearby Cenarth has lovely waterfalls and a good selection of pubs/tearooms although it can get busy, plus the National Coracle Centre (01239 710980). Wales’ biggest and best preserved Neolithic dolmenPentre Ifan is a few minutes’ drive away and above it are the Preseli Hills from where the Bluestones of Stonehenge were quarried. The best option is The Boncath Inn (01239 841241), less than five-minutes’ drive away, a traditional, friendly pub offering decent pub grub and ales. Just down the coast at Newport is the Cnapan Restaurant (01239 820575), one of the best eateries in Pembrokeshire. The site is on the south side of the B4332 mid-way between Eglwyswrw and Boncath. The postcode is SA37 0JE. On booking we always send directions as SATNAV is not always reliable due to our large postcode area. For practical ease most of our visitors come by car, we are not far from most places and you can enjoy a cycling holiday around the area. Trains are now more frequent on the South West Wales line to Fishguard, you can reach our site from Clunderwen Station on this line, or Fishguard station which is slightly further. The bus from Clunderwen is the 430 from Narberth to Cardigan. The bus from Fishguard to Cardigan is the T5, you alight at Eglwyswrw. There is a range of pitches and pitch sizes, all are big and not overcrowded. There are long grass areas and bushes around the pitches for privacy. For very large tents please specify and we will allocate a space. Vehicles not allowed on the field, wheelbarrows supplied for your kit. Damson off grid cabin is set in the old orchard with plenty of space outside, sometimes cabiners friends also bring tents and pitch up next to the cabin. Preseli Cabin is on the edge of the camping field with its own hedge lined garden area. Our converted horse lorry Romerco is set in its own meadow, very private and secluded ideal for couples or friends who want to chill in their own space.